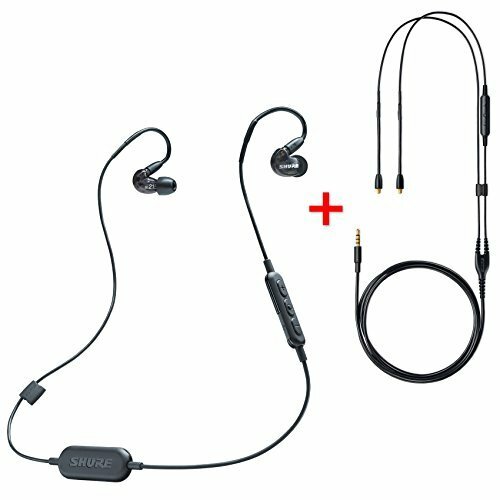 Shure Wireless SE215 Sound Isolating earphones with Bluetooth Communication cable provide hour-afterhours of rich, detailed sound with enhanced bass with the freedom of wireless and simplicity of Bluetooth. Providing up to 8 hours of immersive audio on a single charge, up to 30 ft. (10 m) of range and remote + mic hands-free control and functionality, Wireless SE215 Sound Isolating earphones are an essential tool for today's mobile media consumer. Includes USB charging cable, fit kit and zippered carrying case. The Shure Remote + Mic Accessory Cable (RMCE) optimizes Shure SE model Sound Isolating Earphone (SE215, SE315, SE425, SE535 and SE846) for hands-free use. An inline remote and microphone offers control of key mobile device functions and media playback in a rugged 50" Kevlar-reinforced cable. iPhone features include: Controls playback, volume and calls, and use with SIRI Play Music, Pause Music, Volume Up/Down, Skip to Next Track, Skip to Previous Track, Restart Current Track, Fast-forward, Send/End Call, SIRI, Take Photos.